More than a billion people worldwide experience problems related to sleep, which can have a significant impact on their health, productivity, and overall quality of life. In the United States alone, an estimated 25 million people suffer from obstructive sleep apnea, a disorder in which a person’s breathing is repeatedly interrupted during sleep. If left untreated, sleep apnea can cause a variety of serious health issues, including hypertension, stroke, heart disease, diabetes, mood and memory problems, and more. Now, thanks to the ApneaApp technology from the University of Washington, people around the world can better understand their sleep in order to improve their health. One of the barriers to identifying — let alone treating — apnea and other sleep-related issues has been a lack of useful data about the quality of people’s sleep. Clinical sleep studies such as the standard polysomnography test are time-consuming and expensive, while consumer sleep trackers often require the purchase of specialized hardware and can yield inaccurate or incomplete information about a person’s condition. 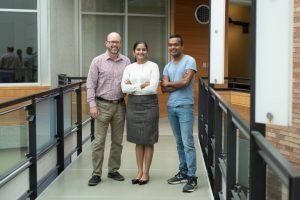 In an attempt to put these issues to rest, Ph.D. student Rajalakshmi Nandakumar and professor Shyam Gollakota of the Allen School’s Networks & Mobile Systems Lab teamed up with Dr. Nathaniel Watson of the UW Medicine Sleep Center to create ApneaApp, which turns a smartphone into an active sonar system using the device’s built-in microphone and speakers to effectively track changes in a person’s breathing during sleep — without requiring specialized equipment or an overnight stay in a hospital or sleep clinic. The technology behind ApneaApp was subsequently licensed by UW CoMotion to ResMed, a global leader in sleep technology and medical devices. The company forged a joint venture with SleepScore Labs to launch a new contactless sleep tracking app, the SleepScore mobile app, earlier this summer — putting the benefits of the ApneaApp technology into the hands of consumers for the first time. 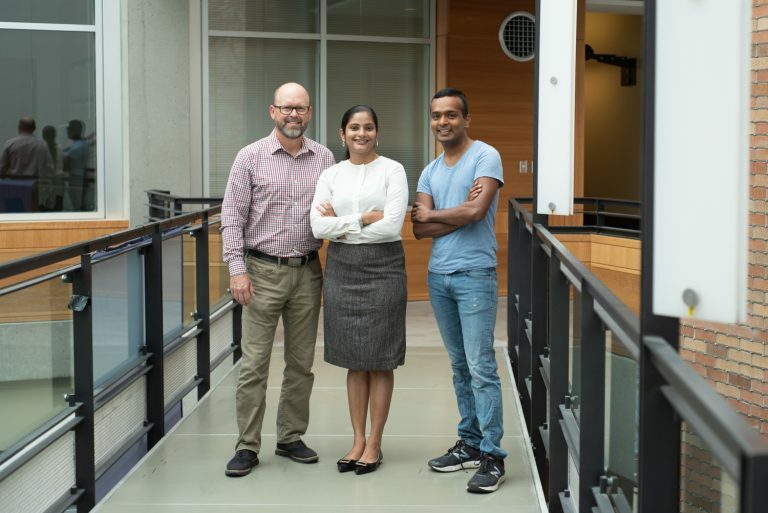 “It is extremely gratifying to bring this research from the lab to the public,” Nandakumar, who was recognized with the CoMotion Graduate Innovator Award in 2016 for her work on ApneaApp, said in a press release. The SleepScore app measures a person’s breathing by emitting inaudible sound waves from the phone. Those sound waves are then reflected back to it based on minute changes in the subject’s chest and abdominal movements. Using algorithms and signal processing techniques developed at UW, the app gauges from these reflections the subject’s stage of sleep, time to sleep, and number of awakenings throughout the night. Michael Wren, senior director of ResMed Sensor Technologies, credited the UW researchers along with ResMed’s Ireland-based software developers and the team at SleepScore Labs for making it easy for anyone to quantify and improve their sleep. “To see and manage a key facet of your health with just your smartphone is an incredible advancement that I hope millions take advantage of,” he said. In addition to analyzing a person’s sleep and producing a nightly SleepScore, the free version of the SleepScore app incorporates tools to support goal-setting and personalized recommendations. A premium version of the app offers additional features, including complete sleep history, analytics, and exportable data that the user can share with their physician. “We are excited that ResMed licensed our research into transforming the smartphone into an active sonar system,” Gollakota said. “And now, through their joint venture with SleepScore Labs, they’ve launched a product that will help enable millions of people to better understand their sleep. Read the UW CoMotion press release here, a related SleepScore Labs press release here, and the original UW News release on ApneaApp here. Download and try the SleepScore app here, and view a recent segment of The Dr. Oz Show featuring the app here.